This would make a lovely present for a girl friend. Packaged in a light glass bottle, with a pink pump, it's vintage looking, pretty and perfect for any dressing table. The powder has a talcy rose scent, and once rubbed in, leaves a subtle pink and silver shimmer on the skin. For me, this is definitely the star product of the range. The rose pink shade is similar to my natural lip colour, making it a great choice for every day wear. The lipstick is creamy in texture, has a rich floral scent and feels lightly moisturising on the lips. It has a very subtle shimmer, and pigmentation wise, it's sheer but buildable. 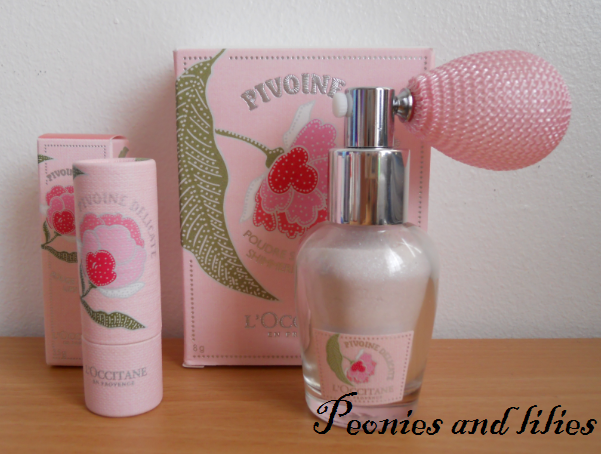 Have you tried anything from the Pivoine Delicate range? What's your favourite L'occitane product? 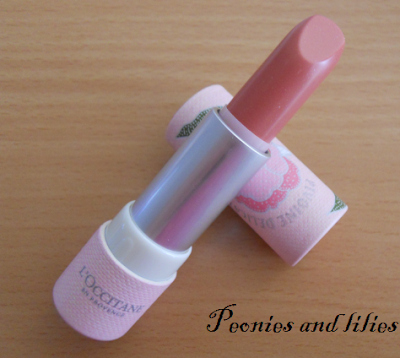 I have been looking around for a nice light pink lipstick, I didn't know Loccitane made makeup. The lip shade looks lovely on you. Were there other colours available in this range? So pretty! I keep seeing great L'occitane posts all over the beauty blogs and it makes me want to go shop and buy all of the products! The lipstick looks like a gorgeous color.